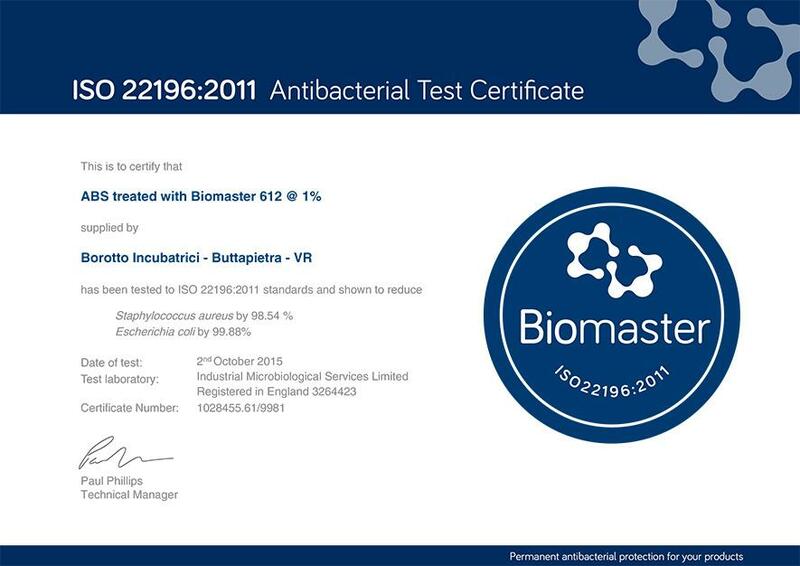 Our products incorporating Biomaster Protection have been tested to ISO 22196:2011 standards to prove its antimicrobial efficacy. The environmental conditions developed inside the machine to ensure the best results during the incubation and hatching phases, both in terms of temperature and humidity, are also ideal for the growth of harmful bacteria such as Salmonella, Campylobacter, Staphylococcus, Legionella , Escherichia coli, etc.. The resulting cross-bacterial contamination of the embryos and early mortality of chicks, are a major cause of reduced hatching results. To reduce risk of cross-contamination from harmful bacteria the ABS material is added with BIOMASTER, antibacterial technology produced by Addmaster UK Ltd. (www.addmaster.co.uk). BIOMASTER contains silver ion technology, which has been widely used for many years in many medical and hospital and laboratory applications worldwide. The gradual release of silver ions provides safe and effective protection against the growth of bacteria. The proven efficacy of BIOMASTER can obtain significant increases in the results of hatching (estimated on average at + 20/25%). BIOMASTER is directly added into the ABS plastic material at the time of the industrial molding, providing antibacterial for a lifetime of the components. BIOMASTER is odourless and completely safe for eggs, chicks and humans. It also helps reduce unpleasant odours.